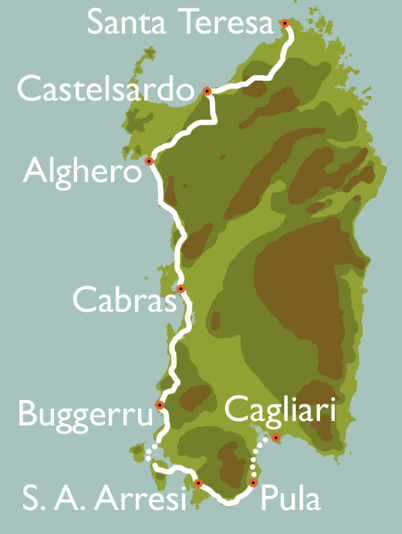 If you are coming from Corsica stage, we propose an optional ride exploring the Costa Smeralda, the very first touristic settlement of Sardinia built back in late sixties by the Aga Khan, an inspired visionary entrepreneur that decided to replicate a bit of paradise in this corner of Sardinia. We'll have a promenade in the glamour of Porto Cervo, and we'll stop at the several marvellous coves. This coastline is beautiful as well along its roads, giving us gorgeous views over a pristine landscape. We know it may sounds incredible, but prepare yourself to even more beauty. If you are arriving today, we meet you at the airport and we shuttle to Santa Teresa di Gallura. At the hotel, in front of a good glass of crispy Vermentino di Gallura DOCG, we talk about the week ahead and helping you with the bike fitting­. Our first stage in Sardinia takes you from the rocky heart of Gallura to the medieval fortress of Castelsardo perched on the cliff facing the mistral wind. We move uphill heading to Aggius, a picturesque village of Gallura, before going down into the Valle della Luna (moon valley) a real evocative spot of Sardinia, a large flat area with sparse vegetation, which seem to emerge from massive granite boulders blocks. The valley connects the Gallura with the pastures of Anglona. A long gradual descent through the silent countryside, leading down to the village of Santa Maria Coghinas, then reaching the ocean in Valledoria on the mouth of the river Coghinas. From here there's a short climb before Castelsardo: a beautiful postcard overlooking the ancient fortress of Doria family. From Castelsardo we climb up the valley of the river Coghinas through the pastures outlined by the characteristic stone walls, until Nulvi village. Then we’ll continue on a beautiful route that overlooks the Asinara bay northside and the hills of Logudoro on the other side, ranging between 450 and 600 meters above sea level. The route continues with a thrilling ride through the lovely countryside that separates the village of Osilo from the town of Sassari. From the white limestone plateaus of Sassari we take the exciting downhill switchbacks of Scala di Giocca, carved in the deep valleys drawing the typical landscapes of Sassari countryside, this gives way to the wide olive groves, vineyards and artichokes fields, real symbols of the rural tradition of this territory. The day ends on the charming ancient ramparts of Alghero. We head south with a great ride along a coastline that reminds the Californian Big Sur and its dramatic beauty. 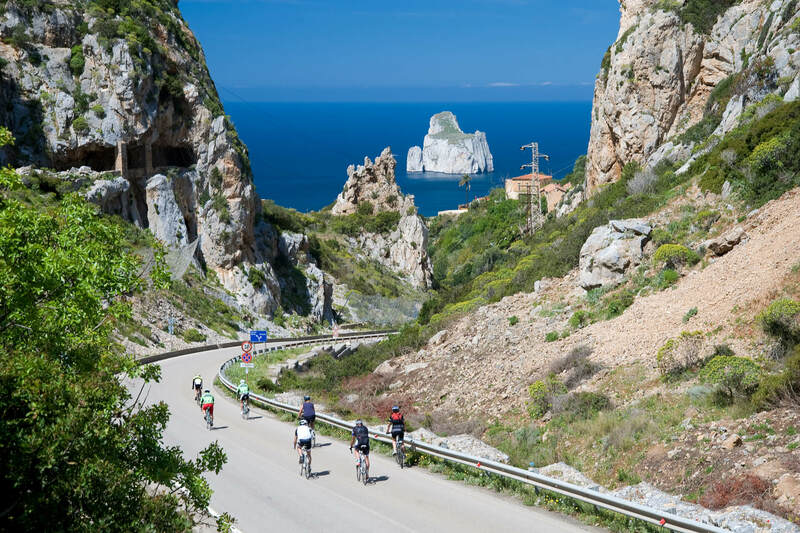 The 45 Km separating alghero from Bosa are definitely one of the most scenic itineraries of whole Sardinia. The road looks almost a terrace suspended over the ocean, backed by majestic volcanic mountains. Then we'll ride inland, through the Montiferru area and its pristine countryside, where silence is broken just from flock bells and landscape looks like a painting. Our stage ends in Cabras, a village built among lagoons, with an incredible shining light. Another spectacular ride, passing on the Marceddì lagoon, a place that seems frozen in time. Then the majestic Costa Verde (the Green Coast) is quite a movie location thanks to the old mining villages and sandy dunes, this is considered one of the wildest area of the island. The mediterranean bush covers like a thick carpet the hills, arriving to the desert sands of majestic dunes. The ocean itself looks wilder here, always moving thanks to the mistral wind. We’ll stop in Portixeddu, just few km before our last effort to get Buggerru, an ancient mining village nested in a cove on the coast. This stage is about old mines, long endless beaches and secluded coves, fields of flowers and vineyards of Carignano grape. We’ll start with the exciting (and challenging) climb to admire the views over Buggerru. From the natural terrace in Nebida, overlooking the “Pan di Zucchero” (Sugar Loaf) cliff, It looks like beauty never ends. Down again along the long sandy beach of Funtanamare, again along the coast until Portoscuso, to get the ferry to the island of Carloforte with its genoan heritage. From here we’ll take another ferry to Calasetta, and we’ll keep riding across the island till the town of Sant’Antioco. The first part of the day we’ll ride across fields, countryside villages, vineyards of Carignano grapes and a taste of mountain before to reach Teulada. Along the second part of the day, like a perfect tour, we’ll enjoy the absolute beauty of the “Costa del Sud” a road that caresses small gold sandy coves, stunning cliffs and embraces landscapes spotted with solitary Spanish watchtowers. After a sight of the fascinating Nora ancient phoenician and roman town, we’ll get our shuttle to Cagliari. - For those leaving we’ll organise a shuttle to Cagliari Airport. - The rest of the group will start the tour of the amazing Sicily.